Well, I’ve finally found a use for the hundred-odd photos of “Don’t Touch My Car” plaques I’ve shot at various car shows over the past 10 years, and it’s this, a veritable art piece depicting the warnings in order of least to most aggressive. I can’t tell you when or why I first started taking photos of these signs, though the cover image, from July 2011, has to be one of the first. 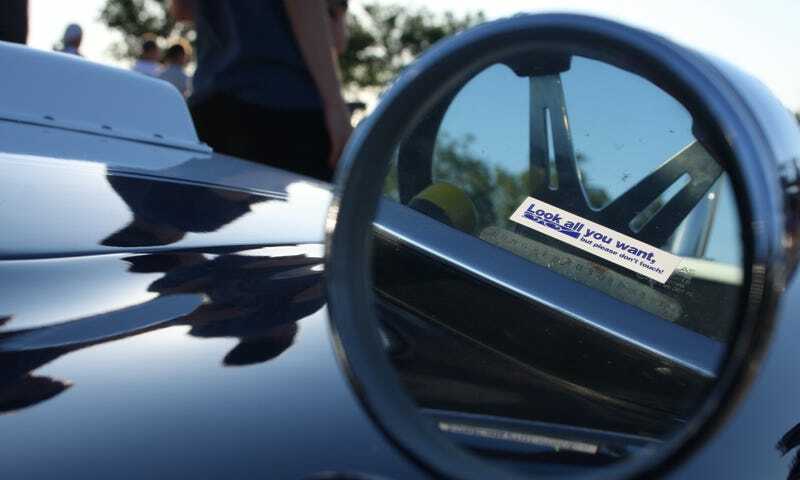 Y’know, that photo might’ve been the very first in the series—I just thought it really neat how the decal put itself right in the mirror when I lined up my viewfinder that way accidentally. I also can’t tell you why arranging them in this order, from über-polite to borderline-illegal-threat, is, to me, at once funny, beautiful, and sad; or why it feels correct, like it adds something to the series. I can’t tell you which one is my favourite; I’ve seen several creative ones over the years, but sometime the angle or lighting is just better on some than the others. But I can tell you that this space – and I guess more importantly my life – is going to look at least a little different next year. As I’ve just informed my colleagues, I’ll be leaving my position as chief editor of Autofocus.ca at the end of December, to join Cletus at the National Post’s Driving as a writer-editor. There’s doubtless going to be more time to write there, so expect to see more posts here, too. I’m quite looking forward to it, and hopefully I’ll be able to post here in the New Year about what a wonderful transition I made.